More than 140 golfers turned out for the 15th Annual Jean & Joan Cancer Fund Golf Tournament held at Kings Creek Country Club Monday, September 29, resulting in an additional $30,000 being raised to support cancer patient services at the Tunnell Cancer Center at Beebe Healthcare’s Rehoboth Beach Health Campus. Since its founding in 1999, the annual tournament has enabled the Jean & Joan Cancer Fund to donate $380,000 from tournament proceeds to the Tunnell Cancer Center. At the Tournament, Kathy Cook, nurse navigator for the Beebe Healthcare Breast Health Program, was honored as the recipient of the 2014 Tunnell Cancer Center Service Appreciation Award, which is presented in conjunction with the tournament by the Beebe Medical Foundation and the Jean & Joan Cancer Fund. Longest drive honors (hole #2) were Mena Colucci, (Women), Greg Martini (Seniors) and Brian Andrews (Men). Closest to the Pin awards went to Marva Delaney (Women #8); Rich Kenny (Seniors #5); and Phil Ricker (Men, #16). The tournament used a scramble format. Players began the day at a kick-off luncheon, and participated in a post-tournament reception and dinner, with prizes and silent and live auctions. The Fund was founded in 1999 in memory of local cancer victims Jean James and Joan Martin, and the charity tournament has been played at Kings Creek Country Club every year. Caption: The 15th Annual Jean and Joan Tournament set a record by raising $35,000 this year. At the awards banquet, Nurse Navigator, Kathy Cook from Beebe Healthcare’s Tunnell Cancer Center was recognized and received the Service Award. 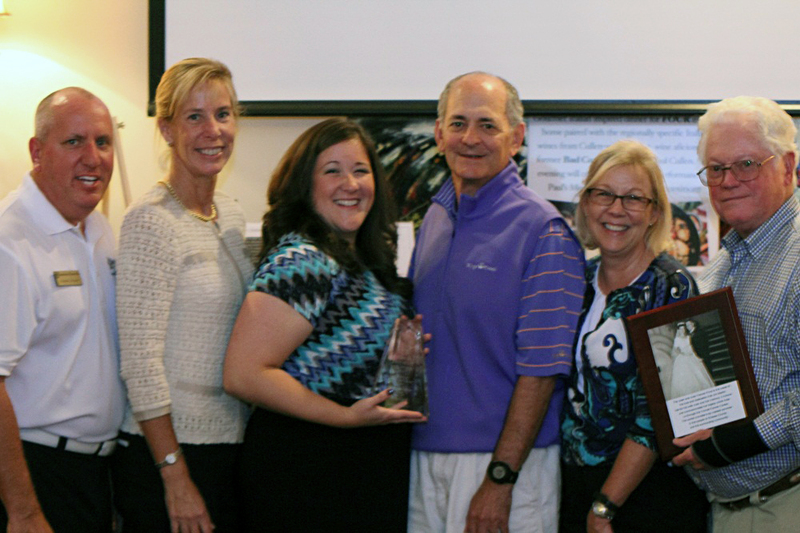 Shown (left to right) are Tom Protack, Director of Development, Beebe Medical Foundation; Vicki Tull, Co-Chair of the Jean and Joan Golf Outing; Kathy Cook, Nurse Navigator; Jeffery M. Fried, President and CEO, Beebe Healthcare; Judy Aliquo, President and CEO, Beebe Medical Foundation; and James Martin, Founder and Co-Chair of the Jean and Joan Cancer Fund.